Hoosick Falls Village Hall is located at 24 Main Street, Hoosick Falls, NY 12090; phone: 518-686-7072. The first permanent settlers of the Hoosick Falls area were Isaac Turner and Joel Abbott. These pioneers from Connecticut came to Hoosick Falls in 1774. In 1786, a water-powered grist mill was established by Benjamin Colvin, and in 1791, the first bridge over the river at the falls was constructed. 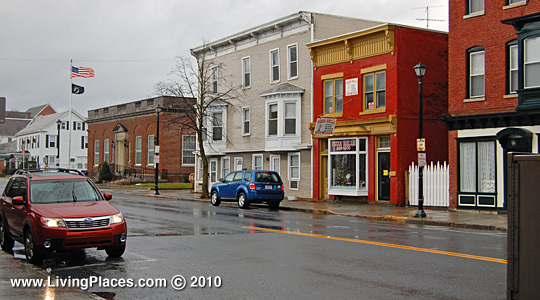 Hoosick Falls began to prosper in the early 19th century. A post office was established in 1822, and the village was incorporated in 1827. The most significant factor in the village's growth through the early 19th century was its location along the Hoosick River, where the rushing water from the nearby falls provided an abundant source of water power. A number of industrious New England entrepreneurs came to the Hoosick Falls area and applied their knowledge of water power to various industrial enterprises. Two cotton factories, the Caledonia Cotton Factory (1823) and the Tremont Cotton Factory (1831) were the most significant operations. Besides the two large manufacturing concerns, the village of Hoosick Falls contained grist, saw, oil, carding, and cloth dressing mills, and 60 dwellings in 1836. Robert M. Powers, consultant, and Raymond W. Smith, New York State Office of Parks and Recreation, Division for Historic Preservation, Hoosick Falls Historic District, Rensselaer County, N.Y., nomination document, 1979, National Park Service, National Register of Historic Places, Washington, D.C.